Morning came pretty early on Saturday. The benefit of falling asleep in your clothes is that you don’t have to change at all. I did anyway. We had the troupe loaded in the van by 8 a.m. and we were headed south. A wonderful and completely uneventful drive. The next part of the adventure started when we arrived at the Darling Reunion Camp just outside of Venita. A great, one time of the year campground that is perilously close to the entrance of the Oregon Country Faire. Trying to explain that we had this wagon we wanted to pull down from our trailer and roll it into the Non-motorized area of the campsite was a bit of a stretch. Much confusion ensued until we found a Champion in Big Dan who made everything go smoothly. 20 minutes later we rolled our wagon, laden with all of our camping stuff right into the site. Fortunately the wheels still rolled even though they were at a wonky angle. Creaking along I could see that we stopped everyone in their tracks as the wagon rolled by. We set up, got dressed and headed for the fair. Now this is where the story gets a little one-sided. We had been to OCF a few years before when the girls were really little and we were excited to be back. Long before we ever imagined performing was something we might do. We applied to be performers at OCF but are pretty sure they looked at our application and said “puppets?!? 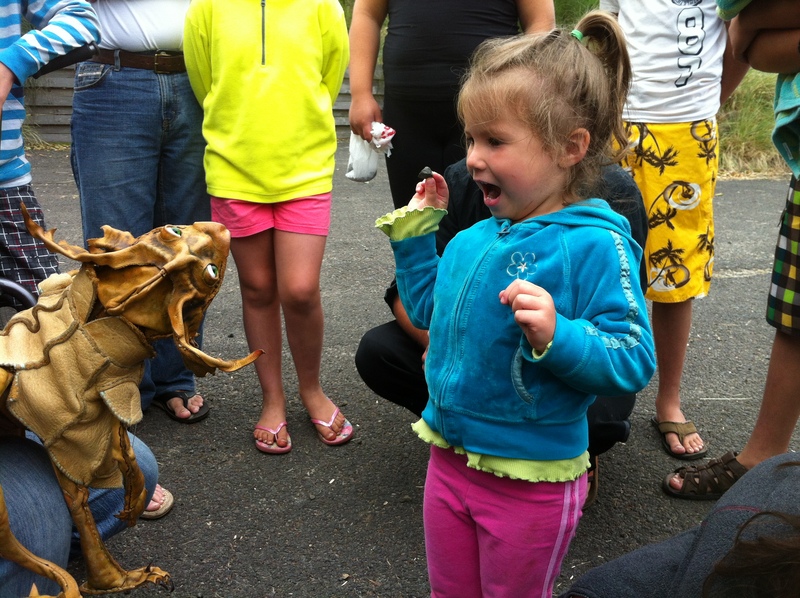 we don’t need any more puppets!” Even so I still really wanted to see how our little creatures would fair at the Faire. I pulled Gryph out of his cage and the girls rolled their eyes a chorus of voices chimed in. “I thought we were just going to the Faire!??? !” “We are, I am just taking Gryph!” I said. I waited for a rebuttal but instead they all just started walking away. To make her point clearer Izzy threw me a burning glance over her shoulder and walked faster. I told Gryph to be quiet at least until we got to the fair. Somehow I knew there was no chance. The walk to the entrance of OCF was quite interesting, dodging hippies selling “sandwiches?! ?” and a stunning variety of hookah pipes we finally arrived. We stood at the entry way and the smell of dank wood, Patchouli oil and a world of food prickled our nostrils. As we were getting our hand stamped Gryph already had a new nickname and we heard it said so many different times it started to make us giggle. “What the ƒµ©√ is THAT!” over and over again. As we walked in someone coming out said that Gryph was the coolest thing he had seen all day. Gryph was a hit. Once inside we actually had to put him away a few times just to be able to walk more than 20 feet without stopping. It was lots of fun. For me that is. Apparently, I was slowing the girls down in their shopping adventure and got an earful. Gryph went in a bag for a bit but quickly found his way out again. The best moment of the day was when a security guard came from over my left shoulder and started to say. “I am sorry sir, there are No Animals,……SQUUUAAAAAWWWWK……..Nevermind, carry on!” He was laughing as he walked away saying “should have known?! ?” and Gryph stood bolt upright on my arm following his gaze. The folks around us had a good laugh too. 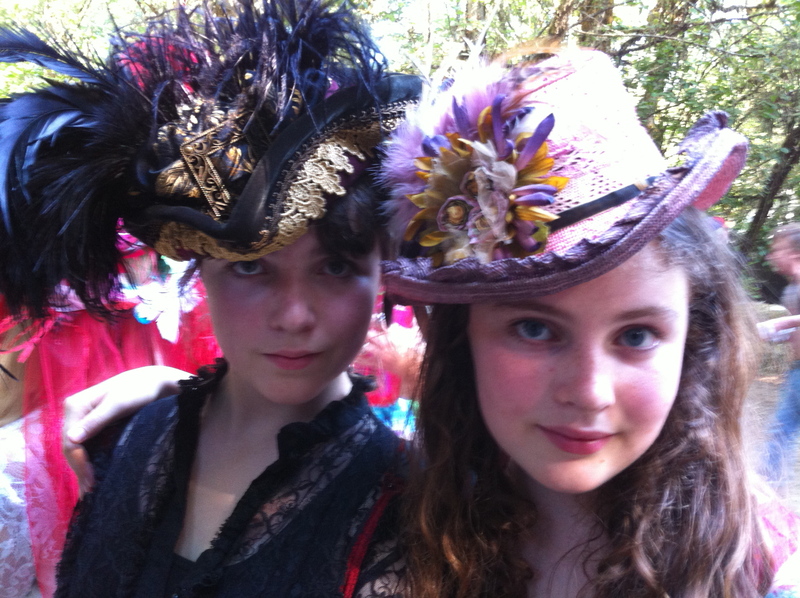 It was a great day at the Faire and my young ladies found a couple stunning hats that needed to come home with us. 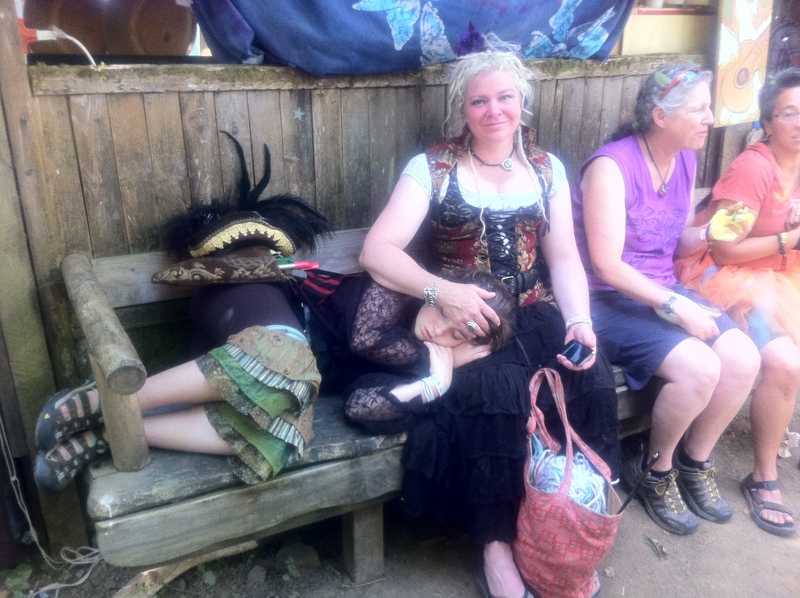 Nighttime at the Oregon Country Fair is probably not unique but it seems the revellers are well versed in Psych Ops tactics deployed by the military. One word, EARPLUGS. I finally took mine out around 5 a.m. but then was woken by a loud techno beat that made my eyelids twitch uncontrollably. I stepped out into the dawn light and heard, Unka, Unka, Unka, Unka, Unka, Unka, Unka, Unka, Unka, Unka. As I focused my eyes a Black hoodie clad youth was tripping out and spinning his hands in front of his face wearing some LED Michael Jackson-esque gloves. As I lurked over him I said something that got the music to stop. I shuffled my feet back to our tent and fell in. I put my Earplugs back in and it was almost 10 before I finally got up. In what seemed like a blink the first part of our Adventure was Over. 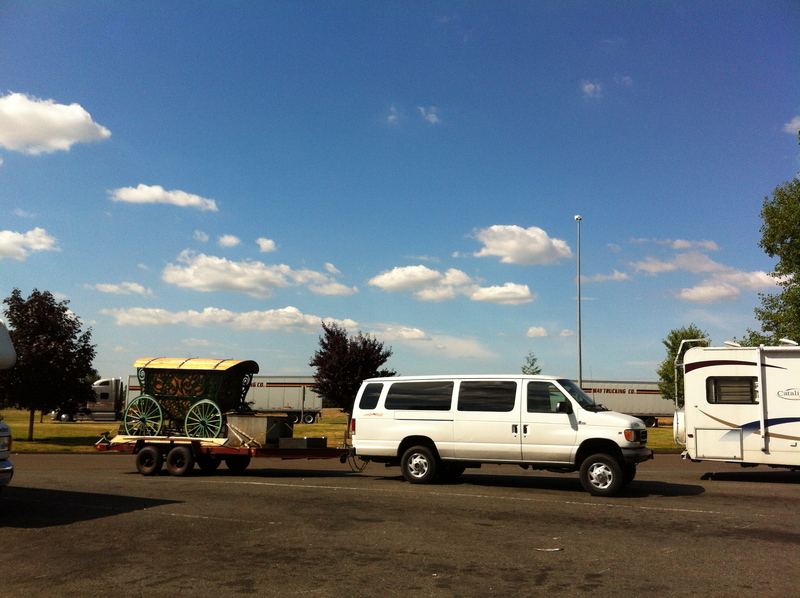 We had made it south, the wagon was still intact(sort of) and we were excited about the second phase of our trip. We drove back to Portland and visited with some friends. This was terrific for me as they had a whole shop full of tools. More dialing in of details and time to fix the travel case I cut down to fit on the back of the wagon. After a wonderful few days we then moved out to the beach to catch a couple waves (or surfers) before heading to FaerieWorlds. The highlight of this part of the trip was using the 10 ton scissor jacks to hike up the frame of the wagon and then using the 4 ton Ratcheting tie downs on the trailer to bend the axle back into shape. It actually worked! Well,…. it worked the same way that a band-aide works on a wound that really needs stitches. The wagon’s axle has moved to Number one of the “really gotta fix that for sure” list. Just as we finished packing up to make our final push to Eugene and FaerieWorlds the most Nymbol moment of our beach trip occurred. Earlier in the day Nymbol and Gryph made friends with a very large and very wonderful Russian family at the campground. They now invited us to lunch and their mom’s birthday celebration. The food was amazing and it was the best and most flavorful Birthday cake ever. There is whole other story but that is for Nymbol and another time. I am still amazed at how that little round bellied, pointy eared companion of ours opens up doors and hearts all around. ………stay tuned for the last chapter of Nymbol’s Secret Wagon. 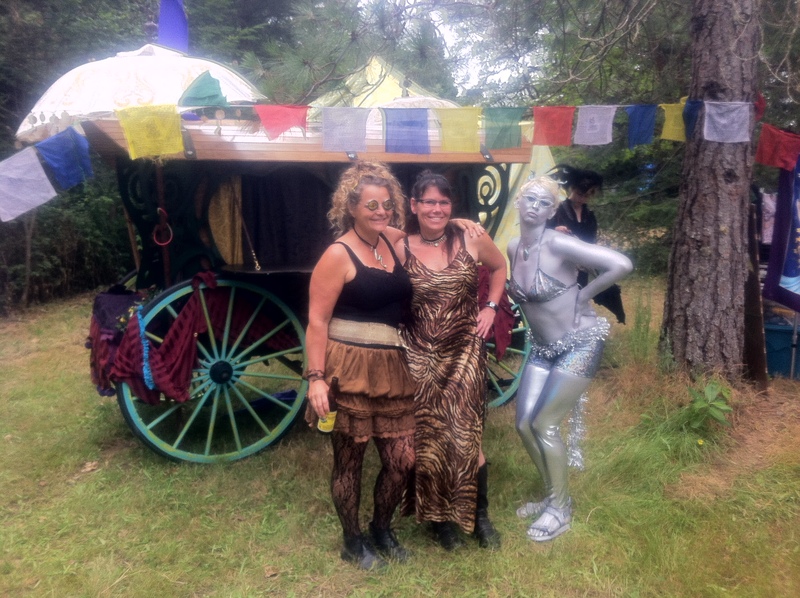 How cool of you to share your OCF journey with us truly fanatic, committed, FaerieWorlds & Nymbolnuts fans. In following your narrative, I felt brought along in somebody’s pocket, so thank you so much for that. Also, I have never actually experienced that particular faire, so it was quite amusing to hear of your experience, having only seen you, Nymbolnuts & co. at FaerieWorlds & FaerieCon Winter Seattle before. YAY! 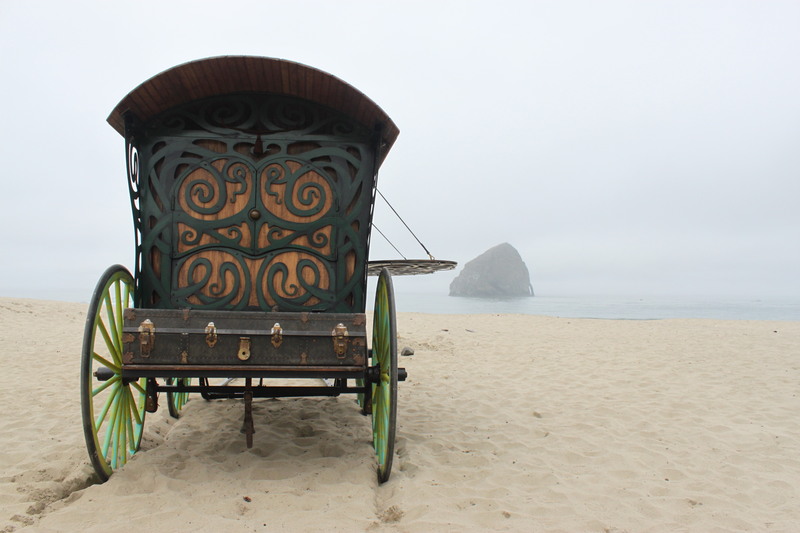 I spied the beautiful, small gypsy caravan right away at FaerieWorlds, & loved everything about the grove. Got rave reviews about the tea parties & plays, as well. You folks are truly special, magical, and child-spirit friendly. And I also mean that you are spirit-friendly to the inner-child spirits of us adults. That’s so huge, magical and important; especially for adults who might not realize it at the time, but “get it” later. So Bless you & your family! Thanks for the kind words. We so enjoy what we do we hope a little of it rubs off.